It's a Saturday and I cannot simply write that it is just another Saturday. For the last three years of my life, there has been no difference between weekends and weekdays. I would get excited if I got a weekend off and would run away to my cousin's place at Juhu to chill out. Chill out meant, spending a quarter of my salary on eating, roaming, and shopping and sleeping throughout Sunday. However, this is a life I have chosen, and I had decided to live a life like this one since a very long time. One day in 2001, early morning during breakfast, I just randomly decided to become a journalist. As I didn't have any idea about how to become one, I often looked upon at people who were in the profession and industry. Over time, I acquired good social skills — be it virtual or real. One random day, while browsing through my social life, I stumbled upon one Abhijit Dasgupta. To my misfortune or luck, I confused him with a former editor of a tabloid. He quickly corrected me and made sure that I did not feel bad or ashamed of my misjudgment. By chance, he invited me over to his office for lunch and I with one of my friend (who acted like my bodyguard) went to meet him. We became good friends, and he became a father figure. He would tell me, "Kiddo, stay away from journalism. You will only get hurt. It is not the profession for you." And I would not listen. He would call me the Cosmopolitan girl, and all that he could come up with. In the days to come, we would celebrate another close friend's birthday, miles away from the friend. I still remember having chicken bharta and rumali roti. I could write and write well. He would tell me, "You write well. But when you write from your heart, you write the best. Stop being a rational writer." And I would ignore. Blogging earned me an internship with the same tabloid, with whose editor I confused him. I moved to another city and by the time I shifted back, he had shifted to another new city. He was not happy. We would chat and he would say, "Kiddo, when are you going to write my biography? If you don't, I will be very disappointed." I would then send him questions, he would answer and then moderate them and send it again. At nights, we would be busy in our mutual admiration for music and good liquor. There were days when he along with two other very close friends would be my saviour. However, he never scolded me. He always saw the funny side of a bad situation. He knew how to make people smile, especially me. He also knew that I did not like him colouring his hair black or pampering someone too much. But, he never changed that. I knew he was hurting but I could not do anything in the end. His death did not leave me broken or shattered. I do not remember crying or asking why. I knew the reasons and I knew that I could had not done anything. I kept his phone number in my contact list for few years. I saved his e-mails and chat messages. I would stare at his answers for the book and my mind would be blank. A year later when I met a common friend, I would ask why? She in her own way explained. But, I had moved on. Moved on too fast. Was I ashamed of it? No, I wanted to escape the bitter truth of life, that nothing is as sweet as it appears. Years later after his death, I read this post by the common friend and I am taken back to the dreadful day, when I received a call telling me about his death. My first reaction was, "Why was not I the first person to know about his death?" Mean it would sound, but he was very special and I would not share him. He was my Father Teresa, and I would remember him like that. I have been told a lot of stories about him, from people in Calcutta, Delhi and Mumbai. I have heard his versions, I have heard everyone's version. After four years, I would like to remember only one thing that he had once told someone, "Wherever there is spirit, you will find me." Nothing bothers me today, but whenever I am alone, in an empty house, struggling to sleep, I wonder, "Is this how he struggled?" And then, I would shut myself and forget everything. I have to move on, like everyone. I guess that is what he would want too. 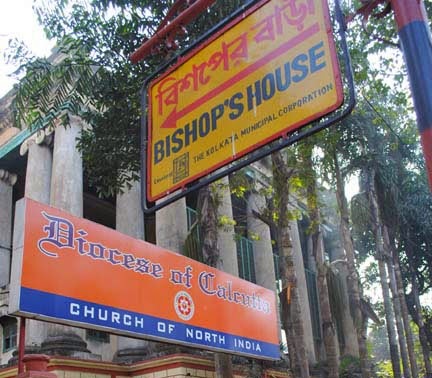 Oh, yes, he promised me that he will take me to Bishop's House, Calcutta some day. I don't want to visit the place ever. I just want to simply remember that he promised. It will always remain special, just like that. You've made me cry. He would chide us! Mega hugs.